Having written a few reviews on the pricier, full metal GBB offerings from TSD, I am happy to be bringing you all a review of one of their newest plastic â€œbudgetâ€ models today! TSD has recently released their M9X series, which are several different M9 models with various grips, barrels, compensators, barrel extensions, and colors, all reasonably priced in the $60-$80 range. 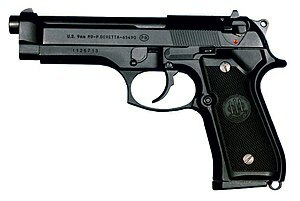 The Beretta 92 is a series of semi-automatic pistols designed and manufactured by Beretta of Italy. It is one of the most instantly recognizable firearm models in the world. The 92 was designed in 1972 and production of many variants in different calibers continues to the present day. The M9 version replaced the M1911 .45 ACP pistol as the standard sidearm of the United States armed forces in 1985. This model is closest to the â€œSâ€ variant, with the slide mounted safety. I was sent this gun directly by TSD in order to review it here on ASR. As mentioned before, this is one of their new M9X series guns, which are currently available at most major airsoft retailers such as ASGI, priced between $60-$80. This model is priced at $80, as it is one of the better equipped models available in the lineup. The model sent to me by TSD was the â€œTactical Opsâ€ model, featuring a plastic rail mount attached to the frame, a threaded metal outer barrel, and a lightweight metal barrel extension, complete with internal barrel assembly. The majority of the gun is made of plastic, namely the frame, slide, and grips, but the metal outer barrel and magazine help balance the gun out quite nicely. The M9X series is fully compatible with TM parts, as indicated on the box. The M9X arrived in a typical TSD box, complete with a picture of the gun held within, and a new addition: a picture of Uncle Sam telling you to register your gun at www.airsoftsd.com. You can register your gun for warranty purposes under the â€œsupportâ€ section on the website. It comes standard with a 30 day warranty against manufacturer defects. Included with the gun was the metal barrel extension, one 22 round magazine, a small box of iffy BBs, a magazine loading tool (that either doesnâ€™t work, or is smarter than me), and a manual. Different models in the M9X series may come with different accessories than this one. Height (Sight to mag): 5.75"
The externals of this gun are primarily constructed of matte black plastic, with a few metal components thrown in the key areas. I will cover each part individually in this section. The main bulk of the gun is comprised of the frame, which is made of plastic. It is a standard M9 frame, complete with your normal magazine release, slide lock, and takedown lever. The rear of the frame is ribbed to ensure you keep a grip on the gun when firing. The grips are a replica of Hogue overmolded grips, albeit made of plastic instead of rubber. They are quite comfortable to hold, and have very nice finger grooves at the front to help you properly grip this pistol. They are a two piece design, attached using standard flat head screws. The plastic rail adapter is attached to the front of the frame by screws that are located inside the gun. It wobbles a bit, likely due to the plastic on plastic mounting method. It can be removed, but you will have two holes left in the bottom of your frame. It is a 20mm rail, and can mount up lights or lasers quite nicely. The slide is made of the same type of plastic as the frame, which is lightweight and seems to be quite strong. There is a slight seam line located at the very rear as well as the top of the front sight. The recoil spring isnâ€™t terribly strong, and the slide needed to be broken in by sliding it a few dozen times for it to really smooth out. The ambidextrous safety is mounted on the slide, and functions perfectly by deactivating the trigger and locking the slide. The outer barrel is made of metal, and features a 14mm- threaded muzzle. This means that you can mount up the included barrel extension, or pretty much anything else you can think of. Iâ€™ve put a few cans on it, a tracer unit, and even a Noveske â€œFire Pigâ€ without any issues. The included barrel extension is interesting, in that it actually has an extended inner barrel inside, much like the KJW MK23, or the old UHC springer MP5SD. This usually isnâ€™t great for accuracy, but does provide a nice boost in FPS. I am currently looking at opening up the extension to remove the inner barrel, but have yet to do it. The sights are simple fixed Patridge style iron sights, with a white dot painted on the front post. They are not adjustable, and are molded into the slide. They do work quite well, however, and are fairly quick to acquire in normal situations. Overall, despite being mainly plastic, this is a very solid little pistol. It just feels good in your hands, due to the nice weight distribution and â€œfinger grooveâ€ grips. Iâ€™ve never been a big fan of the M9 design, but this just plain feels right. There are no real trademarks to speak of, but there are some markings on the right side of the trigger guard. This pistol utilizes a TM compatible magazine design, so you have a ton of options out there as far as spares go. Iâ€™ve used my WE M9 magazine in it with no issues, although the included mag locks in better (in both this gun and in the WE). It holds 22 rounds, and in the 20 or so fills that Iâ€™ve put it through, it has not developed any leaks as of yet. Accuracy and range without the barrel extension in place, and shooting .25g TSD ammo was quite good, with a man sized target being in grave danger within 90'. With the barrel extension in place, accuracy went a bit wonky, as expected. I was only able to hit a target out to 65' reliably with the extension in place. This inaccuracy is due to how the barrels meet inside the extension. Basically, it's not a perfect transition from one barrel to the other, so you lose a good bit of consistency due to it. Overall, the performance is on par with more expensive pistols that I own, and that is saying something. The hop-up is fixed, but seems to handle .25g ammo just fine, which is what I would recommend using for this pistol. The M9X series utilizes TM compatible internal components, meaning that you have plenty of spare/upgrade parts out there. The blowback unit is made of plastic, but the upper and lower internal frame is made of metal. It slides smoothly, once you break it in a bit. The metal composition doesnâ€™t look great, but it seems to be smooth enough to function well. A bit of polish would probably help smooth it out even more. The sky is the limit as far as modifications go, as there are plenty of metal body kits, upgraded internal components, triggers, hammers, barrels, etc out there for this gun. The threaded barrel allows you to attach all manner of barrel devices to the pistol, and the light rail allows you to throw accessories on the frame. My current setup is pictured below. NCStar pistol light, metal can. I wouldnâ€™t think that I would be as excited as I am about an all plastic version of a gun design that I donâ€™t even really like, but this gun did surprise me. I love some of the features, namely the light rail and threaded barrel, and I like the fact that this will feel nearly weightless tucked into a holster. TSD does offer several full metal M9 pistols (at a higher price), but if youâ€™re on a budget, then this is a great option for you! Many thanks again to TSD, and of course, Airsoft Retreat!